Whata better to leave you for the weekend than one more item by Network Distributing from their The British Film collection of releases? Out on DVD this coming 12th May is comedy Josephine and Men, directed by Roy Boulting, from a screenplay by Nigel Balchin and starring Glynis Johns, Jack Buchanan and Donald Sinden. Arriving in its original 1.66:1 aspect ratio with a brand-new transfer from the original film elements, extras include promotional PDF material, image gallery and trailer. With a runtime of 94 minutes, the recommended retail price will be £9.99. Josephine Luton is about to be married to her wealthy fiancé when she falls for his friend, struggling playwright David. 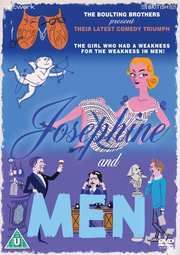 The trouble is that Josephine’s ever-loving and over-sympathetic nature leads her to switch from needful men to even more needful men but for just how long is David like to remain the underdog?